I have been getting soooooo many questions about Shopstyle Collective. What is it? How much money will I earn money from it? Are the links I use in some of my tumblr answers to questions affiliate links? Is it worth signing up for? I decided to write this post to answer all of these questions and to explain how to get started! It's a way to monetize links on your blog and social media accounts! It's great for bloggers because we can search the website for products (it's like google for shopping) and then SSC gives us the links. When we use the links provided and viewers/readers click on them, we make a commission! How much money will I earn from it? There's no magic number. 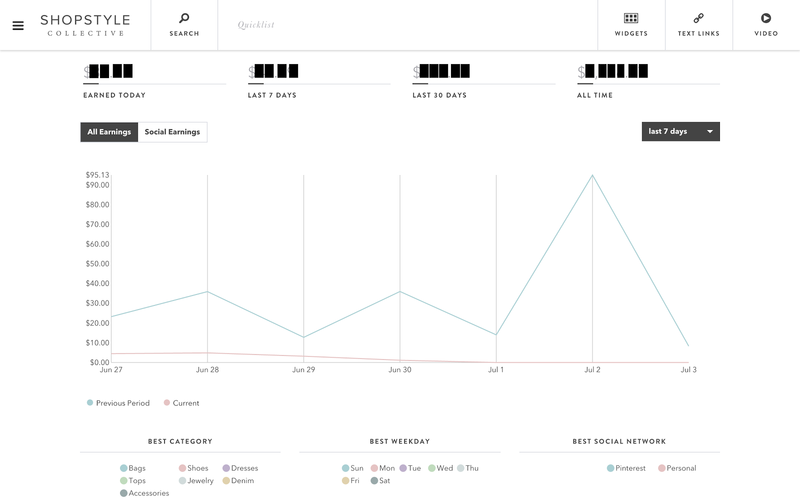 On some weeks, I'll earn 10x more than I earned the previous week. It just depends on how many people click on your links and how often you use the SSC links. Are the links you use in some of you tumblr answers affiliate links? When people ask me style questions on tumblr, most of the time I do answer with affiliate links. It's not about the money to me, but SSC offers an easier way for me to search for products. Earning money is just a fun bonus. I totally think it is. It makes my job easier–– seriously, finding clothing items is such a breeze compared to searching several websites. Visit SSC's homepage and sign up. It's free to sign up for, and it's super easy to do. This is what it looks like once you've signed in. I have blurred out the amount of money I have made because I wish to keep that information personal, but I wanted to show y'all what it looks like! Searching for products is super easy! Just type what you want to look for in the search bar, and hit enter. 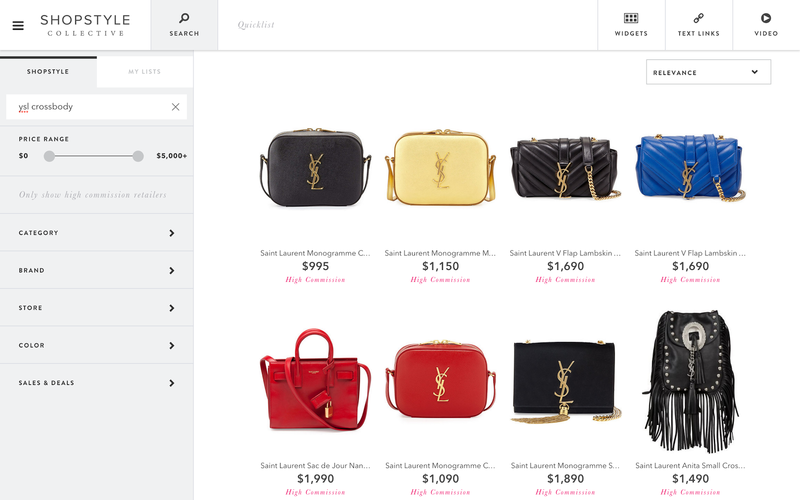 You can also sort through products by color, price, brand, and store. 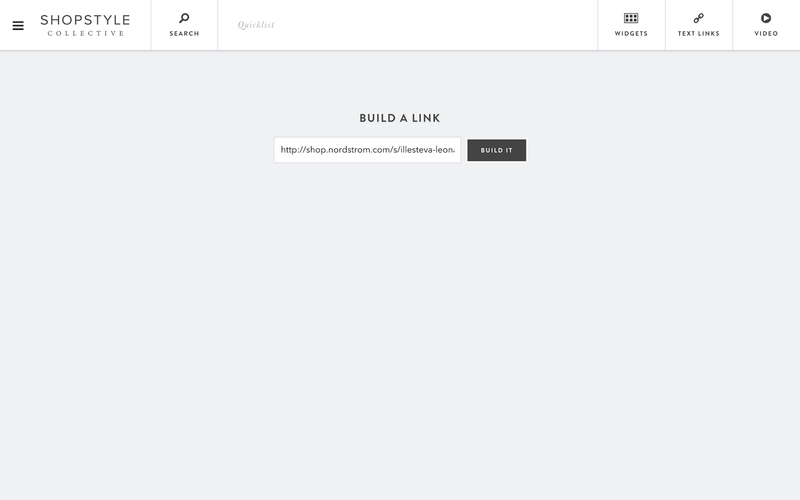 Once you've found the product you want to link to, hover over it and click "copy link." See? It's super easy (and kind of fun). 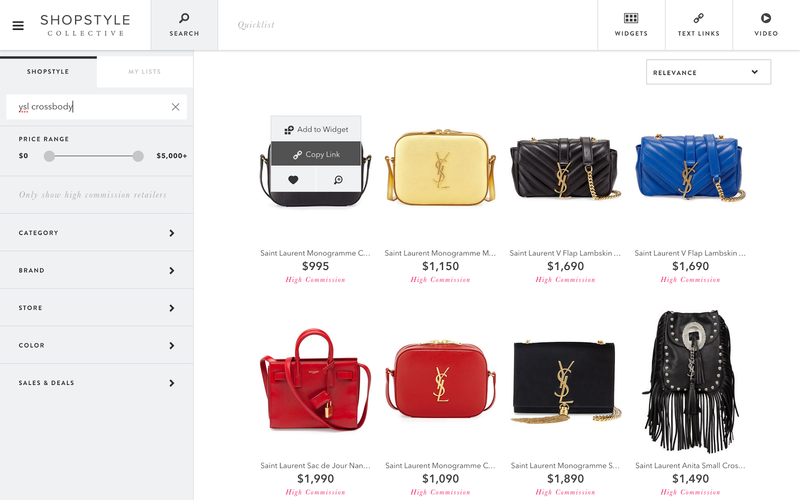 What happens if you're looking on a website (say Nordstrom) and you see a product you want to link to? 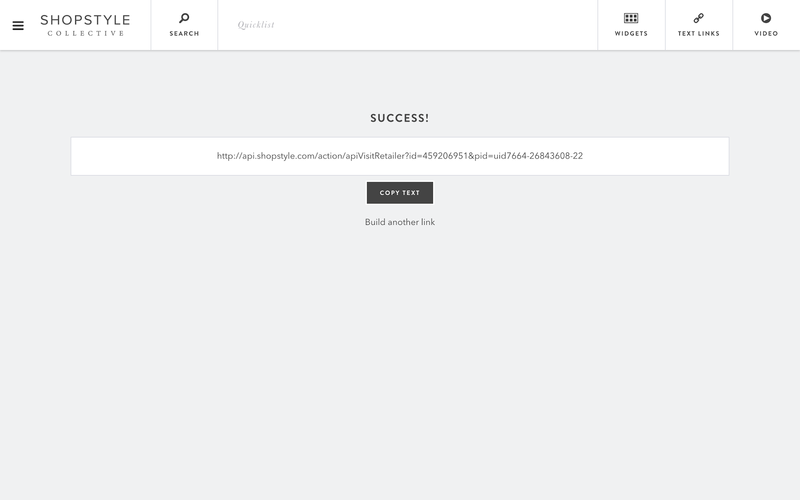 Copy and paste the web address into the link builder and SSC will create a monetized link for you (so you don't have to search for that product)! You can now use the newly monetized link that SSC made you in blog posts! 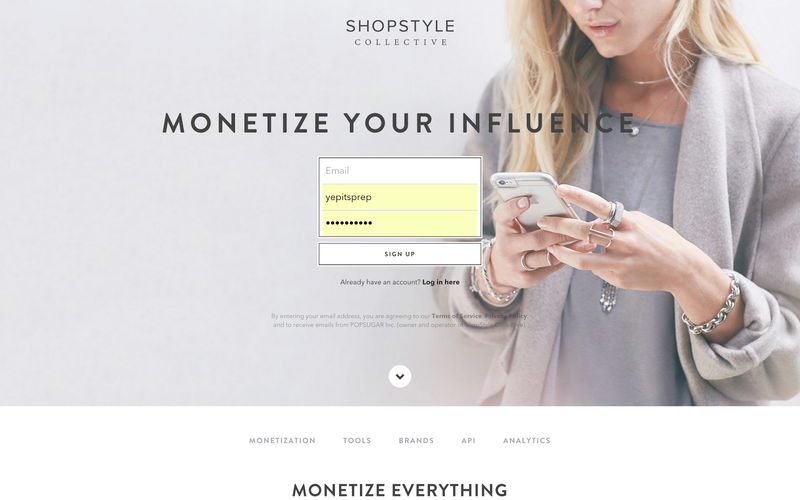 ShopStyle Collective is a great way to earn money while blogging. If you decide to sign up for it, make sure to put a disclaimer somewhere on your blog indicating that you use affiliate links in posts. It's the law! Edit: You can read my Updated Guide to ShopStyle Collective here and my guide on how to monetize your blog here! If you have any other questions about ShopStyle Collective, feel free to email me (yepitsprepblog@gmail.com) or message me on tumblr! 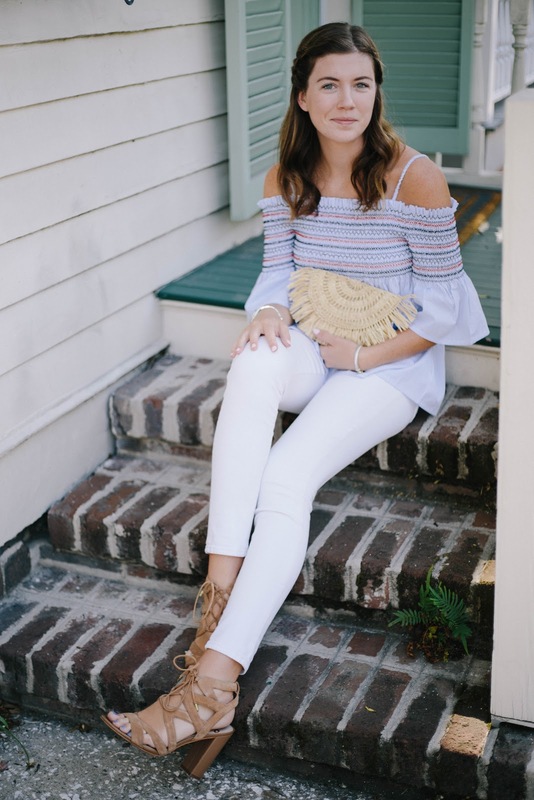 I love ShopStyleCollective. It is so much easier to search up specific items. Thanks for this helpful post. ShopStyleCollective seems like a great store to buy top notch brands and products. The information given here is very helpful. 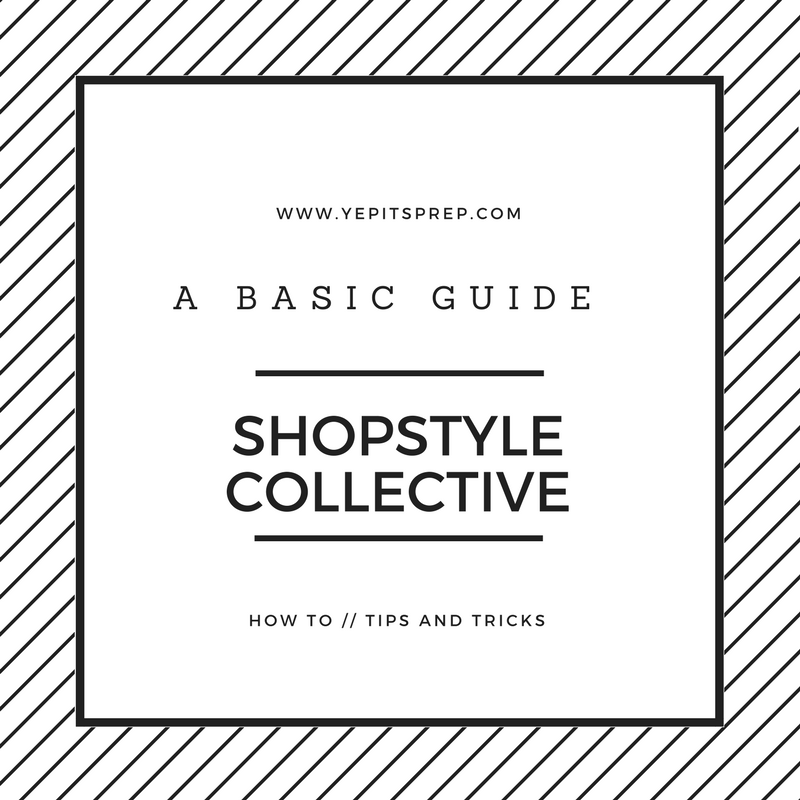 I had been to ShopStyleCollective but, I found the information here much easier to understand. Your use of Shopstyle inspired me to try it out! Don't think that because you don't have a giant readership it's not worth it. It may take a while but the random clicks will add up. Thanks for this guide! This is an asset that I would love to incorporate in my blog, and when I went to sign-up, it gave the option of a promo code? If you have a promo-code, I'd love to use it so that you can earn credit for it too, considering you're the reason I'm looking into this! Thanks for the explanation - it really makes sense and sounds like a great way to implement linking in your website! It's definitely SUCH an easy platform to get used to - I love it! I'm new to it too, so this is a helpful post. Thanks for diving into it! I also use ShopStyle on my blog, but I can't figure out what is the commission (I mean, a percentage) you receive per each sale... Perhaps, you can help me to answer this question? Thank you in advance! Thanks for this post! Super informative and appreciate the information. I've been reading that Pinterest has been removing affiliate links from pins but I'm not seeing that as the case with ShopStyle. Do you have any information or insight into Pinterest's policies with ShopStyle? How does it work when posting on Pinterest? Thank you in advance. Great post! I also use ShopStyle on my blog but after reading this post i've realized I haven't been using it to it's fullest potential. Thank you for being so informative. Thanks so much for this post! It helped me out a lot!! I just found ShopStyle and like the idea of it but unless you already have a large following, you can't make much money using it. If you have the large following, brands are probably already after you for sponsorships anyway. It's an awesome idea though! 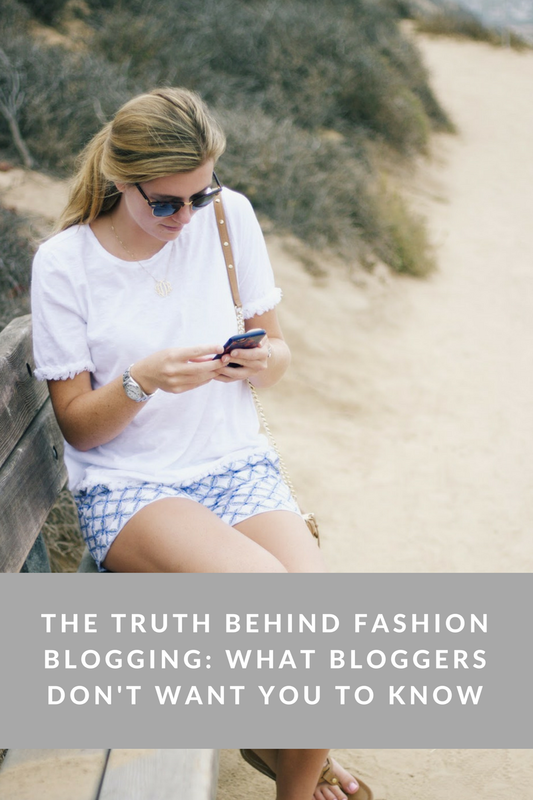 This was so helpful, as a new blogger I'm still learning a lot of this stuff and this post was perfect! Thanks for sharing! Thanks so much! I just started using it. Do you know how payments are made? On what basis? When etc? Very helpful thank you! I want to read more on the disclaimers etc.. Will check out your updated post. At the begining they payed $0.05 per click then suddenly they lowered to $0.03 and finlay they lowered to $0.01 without making me aware of the situation. This is not worth it... I've write 4-5 emails and no one has replayed. I tried putting in my blog and it doesn't work for me. Please help.